Around the late ’70′s-early ’80′s the Binson company built units for Guild and Sound City; both very big names of the time. Don’t quote me on the dates. According my history books Oliver Cromwell lived next door to Nova Scotia. There was a very considerable difference between the gear with ‘Echorec’ marked on it and those we’ve just mentioned. The Guild and Sound City versions were transistor machines and Binson’s usual designs were all valve. 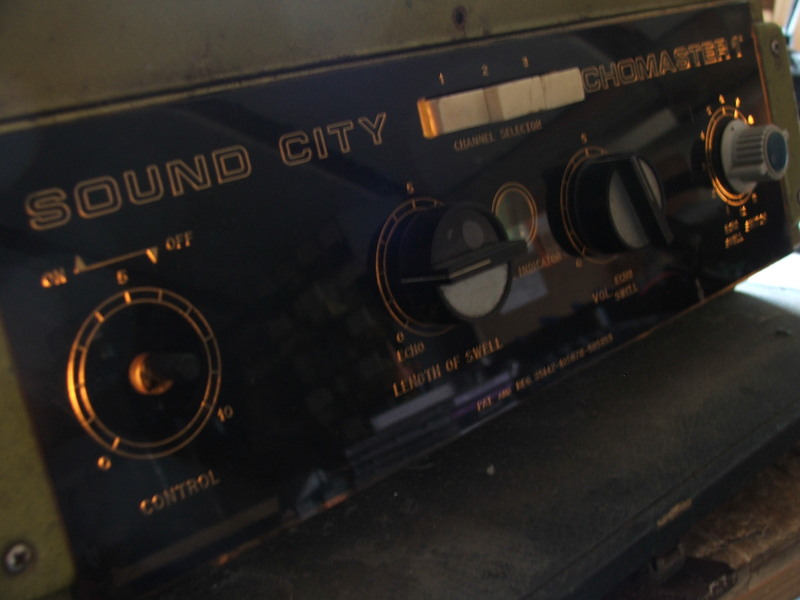 The ‘Echomaster’ was Sound City’s incarnation,and that’s what this is. You have to admit, it looks very cool; they all do. I think they could have knocked one up out of washing up liquid bottles, and they would still have looked cool. Although this model is so different from the usual Echorec models, in some ways they are exactly the same. With many of the same problems. The idea behind any mechanical analogue echo, is that the signal (sound) is recorded via a record head, onto a moving medium; might be a tape loop or a cassette loop of some sort. This sound on the tape then passes across playback heads and this means that the sound will be played back later and at different times from the original sound. There are a variety of ways these repeat echos are processed afterwards, but that is basically the arrangement. The Binson is different. The recording medium is a steel disc which revolves past the heads, and has a recording surface on the edge. Not many designs use this. Schaller did one, and that’s the only other that I know of. The idea is still the same as the tape, though. So that’s a very approximate overview. Should you be so fortunate as to acquire one of these brilliant pieces of coolness (coolity?) from your neighbour who has kept it under a sack of spuds for a half century you should be very cautious about switching it on. Best done with a long stick from behind a wall of sandbags. The coloured cables are the reasons why. They are the originals and the insulation often rots away, so you get bare copper exposed. I don’t know what the insulation was made from, but it could be a rubber-based material and that would perish, so it makes sense. The high voltage stuff is also made of the same materials. The pic shows the job part-way through. The black screened cables have replaced some of the original wiring, but it was all replaced in due course. You have to do (or at least visually check) this wiring BEFORE YOU SWITCH IT ON. Or make sure you get your solicitor to check that your fire insurance is up to date. That means the signal cables and the mains/ HT wiring. It’s a time-consuming job before you’ve even thought about whether it works or not. I’m going to continue with the procedure for setting up the heads and disk on the next blog. Otherwise these things start to look like an unexpurgated big letter version of ‘War and Peace’ and nobody will read it. So what’s new? Read a Schematic? A piece of poop. Let’s face it. It can’t be very hard to do; or I wouldn’t be able to do it. No. Reading one is EASY. You need to be able to remember what a line looks like. And what two parallel lines look like. And what a wiggly line (or a rectangle) looks like. And a triangle looks like. Why do engineers take so long to learn their job, if it is so simple? It’s because the reading is the simple bit. INTERPRETING…..well….that’s something else. So your line (track/wire) goes to this transistor. Fine. But the amp doesn’t work. Not fine. So what can be wrong? what is it supposed to do, just there? Why is this voltage high? why does this chip put out dc? These are questions that happen all the time, and the schematic won’t help you to solve them. It tells you what connects to what, what the ‘what’ is. It doesn’t tell you what it is supposed to do or why it isn’t doing it. Now that is the hard bit. I read some time ago that ‘a good engineer doesn’t need a schematic’. It was written by either a hyper-optimistic or woefully inexperienced bloke. Although I wouldn’t argue with the fact that we can repair without schematic diagrams, (carrying around a lot of generalised ones in our heads) I would argue that the customer will be charged a lot of money for the privilege, and that is an irresponsible attitude on the part of the engineer. It will take much longer without our trusty schematic. Which is why I frequently rail against secretive attitudes of amp manufacturers. “You’ve done this one already” you might say. True, but there are a lot out there and they keep turning up at my workshop. This particular one was another result of a ‘GAS attack’ of Marc’s. He does suffer, does that gentleman. It did throw up a few issues that might be of use to those unwary enough to delve into these things. It also broached the subject of just how much we should pay for…well, anything, really. Now we get to the really expensive bit. For every bloke/robot in the shed actually knocking these things out there are at least 174 blokes in designer sunglasses selling ‘em. It’s called ‘Marketing’ and that’s where our money goes. So we buy things to be persuaded to buy things. 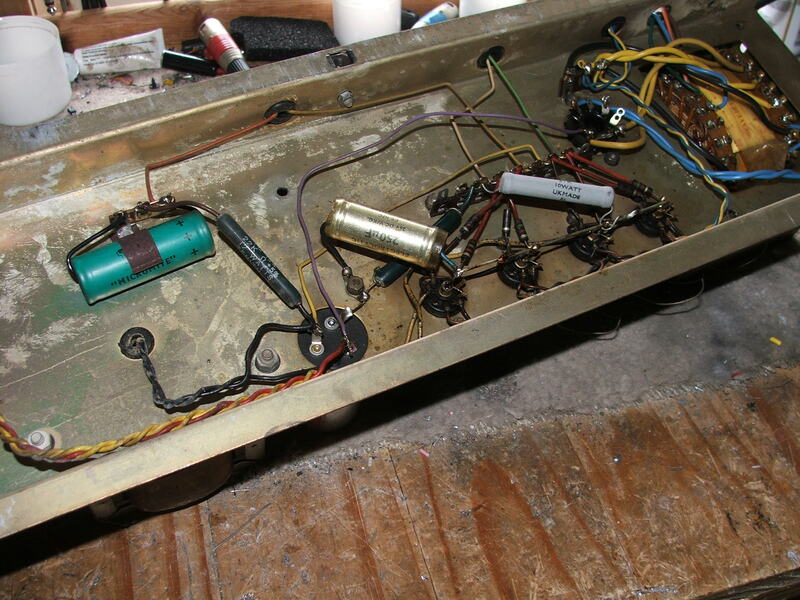 This is the underside of the power section of the Vox AC30. Pretty much original but the mains transformer has been swapped in the past. This was after I got hold of it. I often use solid copper ground rails where they once relied on the metalwork of the chassis. The contact to the frame deteriorates, and you can clean them up as much as you like in a year or two they’ll be back causing you problems again. The output valve bases were replaced with lacquered ceramic bases. They hardly ever track and the gold contacts are very robust. 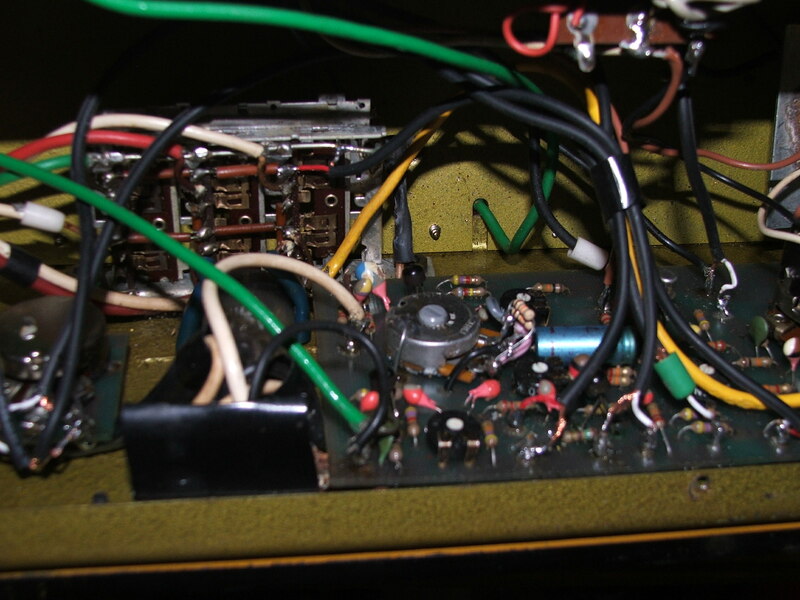 Anyway that’s all pretty specific, but the generality interest comes with actually switching on an old amp that has been in retirement for a long time that has a valve rectifier. Don’t do it. Here’s what really needs to be done. Take the rectifier valve out. Solder a couple of diodes (say 1N4007) to the valve base. 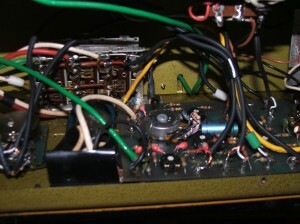 The sides with the silver band are connected together and soldered to the HT output (the single wire that goes to the first capacitor) and the other sides go each to the transformer connections. Then put a capacitance meter across that first capacitor. An ohm meter reading is better than nothing. This one was a short. 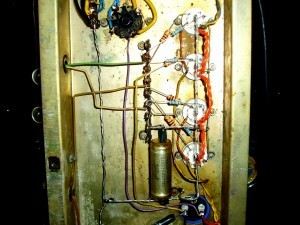 Had I switched that on, the rectifier valve would have blown and it could possibly have taken out the mains transformer. Best to be cautious. 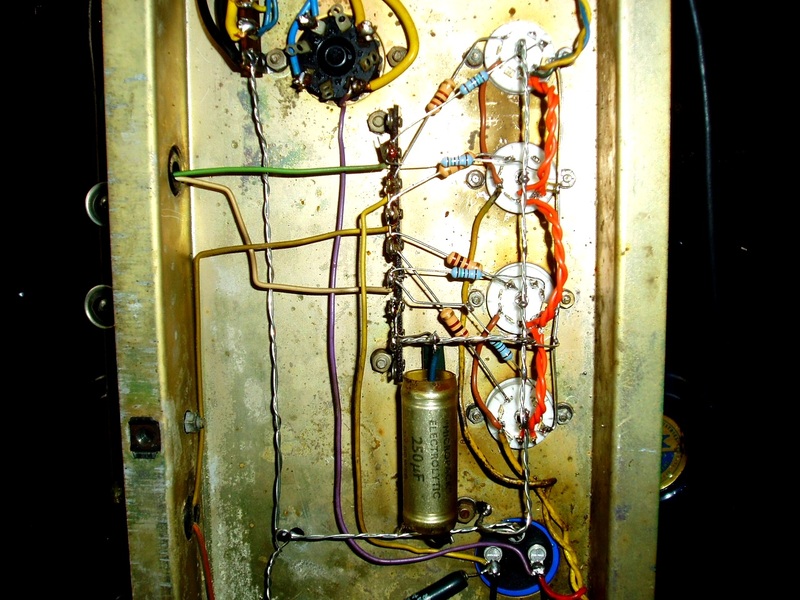 As it happened the rectifier valve also had a short, so that would have been a total disaster. You can check out the whole of the amp leaving in the two diodes. If anything nasty happens, your 20pence diodes will survive, and your nice new £15 worth of GZ34 probably wouldn’t.